Join professional mosaicist Joanna Kessel MA RCA and artist Laura Magliveras BA Tapestry, in Portico di Romagna, for a unique and inspiring holiday exploring links between the fascinating art forms of mosaic and tapestry. Students will use the local buildings and landscape as inspiration. We will explore shape, colour, texture and scale and the relationship between materials within the individual disciplines of mosaic and tapestry. Interpret the surface qualities of mosaic into a woven tapestry as you translate your design from one media to another – expect unexpected outcomes! Materials ranging from Venetian glass smalti to handmade tiles will be provided to make the abstract creative mosaics – with wools, linens and silks for the woven tapestries. We will stay in the charming family run Al Vecchio Convento Hotel in Portico Di Romagna – a small rural village situated in the Parco Nazionale Foreste Casentinesi, equidistant from Ravenna and Florence. The course is suitable for beginners to those with experience in one or other field who are looking for an inspirational creative holiday. A pre-course tapestry or mosaic introductory weekend in Edinburgh will be available at a small additional charge. Numbers are limited to 14 – to ensure a quality experience and plenty of tutor time. The course fee includes: Full board, single room accommodation in Portico. Course materials. 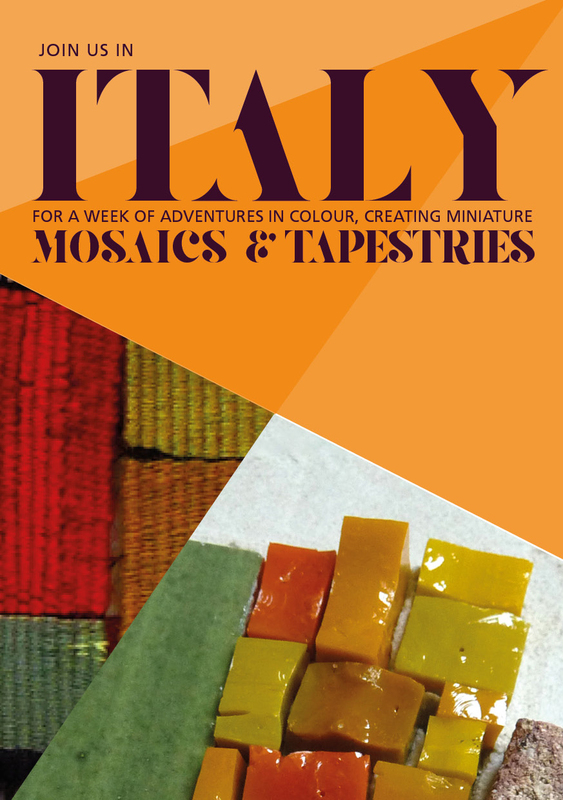 Museum entrance fees and a guided tour of mosaics in Ravenna. An afternoon trip to a local castle and vineyard. Transfers to / from Bologna airport meeting designated Edinburgh Ryanair or Gatwick EasyJet flights and transfers to Ravenna. The course fee does not include: Flights. Lunch, dinner and Friday night accommodation in Ravenna. To allow budget choice, we will recommend 2 hotel options. Individual drinks in Portico.